Published 6/17/2011 . Last updated 1/8/2019 . Biko is a new dessert to me, and unless you are Filipino, it’s probably new to you as well. Biko is a coconut sticky rice cake. When I say rice cake, please, please don’t picture those flavorless Styrofoam-like “desserts” enjoyed by dieters all over America. 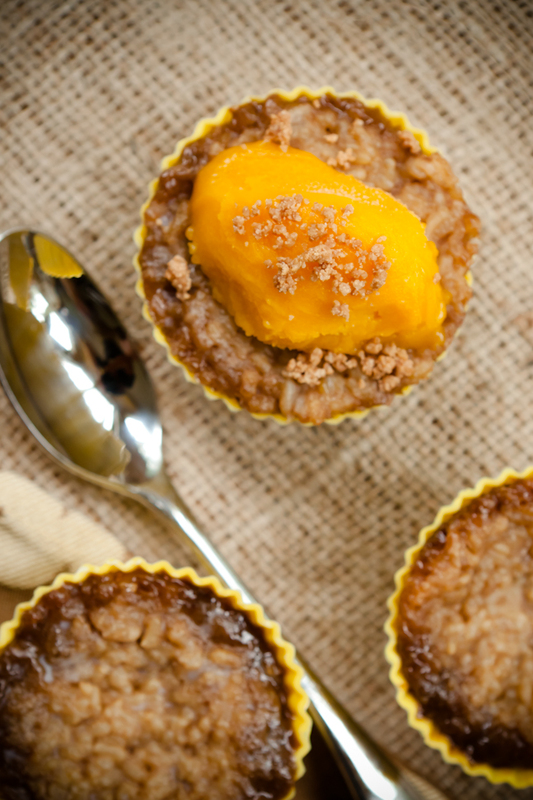 Biko cupcakes are like eating a bowl of brown sugar-topped coconut-flavored oatmeal in cupcake form. Enjoy them warm out of the oven for breakfast or top them with mango sorbet and latik (read my post about latik if that word means nothing to you) as a sweet end to a home-cooked meal. This biko recipe comes from Ivory Hut. I’ve reprinted that recipe with my transformation to cupcakes below. Biko is a coconut sticky rice cake. 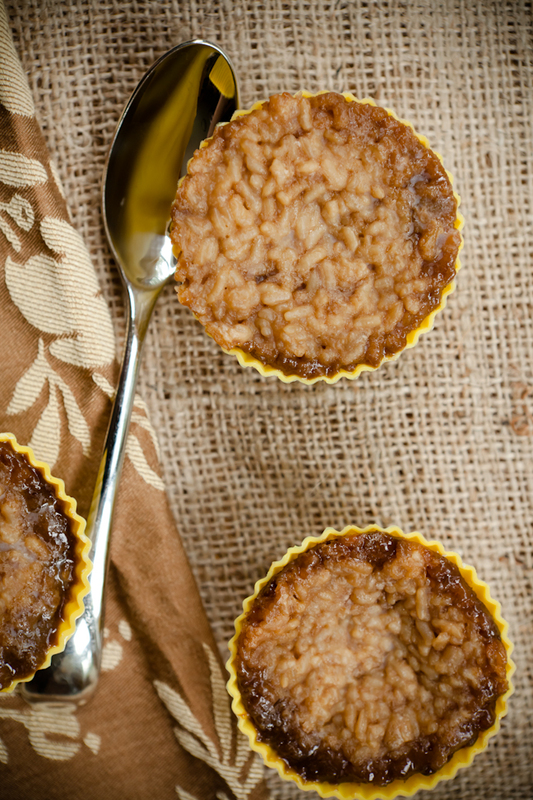 Biko cupcakes are like eating a bowl of brown sugar-topped coconut-flavored oatmeal in cupcake form. Skim one cup of coconut cream off the top of the cans of coconut milk. Depending on the brand, this may take one or more of the cans. Set the cream aside. Pour the rest of the coconut milk, any cream from the cans, and the water into a large pot on medium heat. Whisk to combine. Stir in 1 cup brown sugar and remove from heat. Divide evenly between cupcake wrappers. Note: This is STICKY rice. It will stick to your typical cupcake wrappers. I highly recommend baking these cupcakes in silicone liners or in cupcake liners that are non-stick, such as the If You Care brand. Thanks to my friends on Facebook (especially Adrienne Gauthier) for the tips about the non-stick liners. In a small bowl, mix the remaining cup of brown sugar and the coconut cream. Spread on top of unbaked cupcakes. Bake at 350 F for 40 minutes until topping is dark brown around the edges and the cupcakes have thickened. Serve warm. Optionally, top with ice cream or sorbet with latik sprinkled on top. *If you don't need 30 cupcakes, you can always eat some sticky rice pre-baked as a snack as shown in my post on coconut sticky rice. Another non-stick option might be Reynolds aluminum foil liners. They are also excellent for keeping moisture inside regular cupcakes. Thanks for sharing! The biko looks great. Thank you for sharing. i’ve never tried ice cream on biko. i will definitely try next time we have biko. perhaps a classic filipino coconut sorbet will work great too. how about cutting circles out of banana leaves and using that as your liners for that added filipino touch. biko (or any kind of cake like dessert for that matter) is usually put on banana leaves. i’m not sure though on the availability of banana leaves in your part of the globe though. Anon – Great idea!! I actually thought about using banana leaves a bit too late to make it to the store to get them. Those look DELICIOUS ! I’ll be back on this blog for more recipes. Thanks for sharing the recipe, and for trying it out in the first place. :D woohoo, pinoy pride! Can’t wait to try and make these for my family. Maybe it will remind them home, the Philippines.